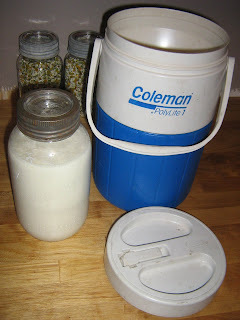 We recently started making our own yogurt again( in a quest to limit our foods that we buy in plastic containers) but I was feeling that there had to be a better way than using the old yogurt maker I've had for almost 20 years. The cups are small (and my kids' appetites large) so it seemed a bit of an effort to go to mixing up the ingredients and making the yogurt for 5 small cups of yogurt that would be gobbled down in a couple days. I also didn't like having to plug the maker in for 8 hours until it set. So, since I am a big believer in the whole "ask and you shall receive" idea, I decided to ask for advice on the virtual homelearning village that we are a part of. I took the advice I got and combined the two methods and came out with this easy method of making it and a 2 quart jar of yogurt which my boys say is much better than store-bought. 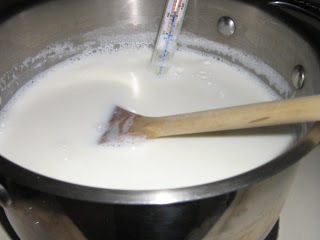 Heat your milk, let it cool to 110 degrees, add some plain yogurt for a starter, put into glass jar that has been heated with boiling water, put lid on jar and place into insulated jug that has also been heated with water. Close up, wrap in towel, wait eight hours et voila. What sort of milk did you use, Heather? If your yogurt is that good, you'll be making it every day! Are you putting it in your smoothies or eating it with fruit? Very good idea. I like those electricity free appliances.